Jorge Lopez pitched for the Timber Rattlers in 2013. His son is fighting a serious is fighting serious medical problems and the proceeds from the Timber Rattlers Throwback Jersey Auction will go to help. GRAND CHUTE, WI - The Wisconsin Timber Rattlers are holding a silent auction for their 20th Anniversary Throwback Jerseys on Friday, August 29. The team will be donating the proceeds from that auction to assist former Rattlers pitcher Jorge Lopez and his family, who are dealing with the serious illness of Mikael, his one-year old son. Lopez, a Milwaukee Brewers pitching prospect, spent the 2013 season with the Wisconsin Timber Rattlers. During last season, Lopez and his wife became parents to Mikael, who was born prematurely. "They told us these were just complications from him being born premature," the 21-year-old Lopez said this week from Space Coast Stadium, where he is helping anchor one of the best pitching staffs in the Florida State League. More doctors and two more hospitals followed, including the leading children's hospital in Puerto Rico where Lopez is from. They stayed at the children's hospital for five months as doctors ran batteries of tests to find out what was wrong with the boy. "He was getting sick a lot, and he wasn't gaining any weight. He had bronchitis and pneumonia and was very bad," Lopez said. "Finally we brought him to a hospital in Miami." That's where they discovered that the little boy's intestines had never worked a day in his young life. An unknown autoimmune disease has necessitated an intestinal transplant. "Now we are waiting to see if the transplant is the answer," Lopez said, realizing all too well that he is a key player in a story about faith, baseball, a rare disease and the need for a miracle. The financial hardships are not just medical for the Lopez family. The costs of transporting Mikael from Puerto Rico to Miami were $8,000 alone. The silent auction for their pinstriped throwback uniforms will be held from 5:30pm until the end of the seventh inning when the Timber Rattlers host the Burlington Bees on Friday, August 29 in Wisconsin's final regular season home game of the season. 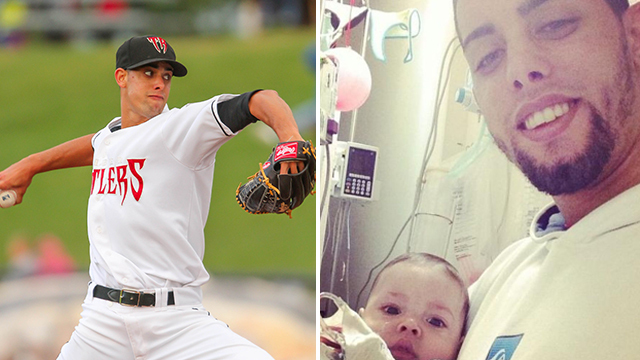 The Brevard County Manatees, Milwaukee's Florida State league affiliate and Lopez's current team, have started a GoFundMe site to assist the Lopez family with their expenses. All proceeds from the Timber Rattlers silent auction of their Throwback Jerseys will go to that fund. Tickets for that game - or any of the remaining Timber Rattlers home games this season - are available online, over the phone at (920) 733-4152 or (800) WI-TIMBER, or in person. The Neuroscience Group Field at Fox Cities Stadium Box Office is open from 9:00 am until 5:00 pm Monday through Friday and Saturdays from 10:00 am to 3:00pm.